I know, I know. You are all over winter citrus and have moved on to asparagus and ramps. However, I can’t resist a beautiful blood orange and had to pick up the last few at our local co-op since these are what I can only assume to be the last batch of the season. I discovered the technique of cooking citrus this past winter and am basically hooked. There is a completely new, sharp flavor that the citrus takes on when caramelized slightly and its not to be overlooked. I recommend using broiled, roasted, and grilled citrus in something that will let the fruit flavor shine instead of burying it under a dish chocked full of too many ingredients. You can count on there being lots of outdoor grilling days ahead with grilled citrus over the open coals. We are dangerously fast approaching salad season here at the Blue Bush (that is the term for our bright blue house that we reside in). Our kitchen doesn’t have air-conditioning so we tend to live off of raw foods for much of the warmer months. Oh and grilling – did I mention how much Midwesterns love a good cookout? Yup, salads for lunch and grilling for dinner. That is our summer routine. Although air conditioning would be super rad, I’m not too mad about it. This will be our third summer here and I’ve learned to really appreciate the diversity that can be made with a big bowl of raw veggies and some wonderful dressing. PS – Today is the last day to sign up for the vegan giveaway I’m hosting where we are giving away FREE shoes and a vegan handbook. Yup, Shoes and literature – how are you not already signed up? Click here to enter before its too late! Turn your oven to the broiler setting and line a baking sheet with parchment paper. Drizzle the cut sides of the citrus with olive oil, salt, and pepper and transfer to your prepared baking sheet. Stick under the broiler until the tops start to brown (this won't take more than a minute or two). Whisk together all the ingredients for the vinaigrette until combined. Combine all the salad ingredients in a bowl and mix in the vinaigrette. Garnish with leftover squeeze citrus. also sheesh, your photos just get more stunning by the second. I was at the farmers market on Saturday and thought damn, there are still a TON of holdovers from the winter season, oranges included! Putting them under the broiler sounds like a great idea. Can you imagine SMOKED ORANGES or grapefruit as well?!?!??! Ahhhh I’d seriously die. Thanks for the awesome recipe, as always! 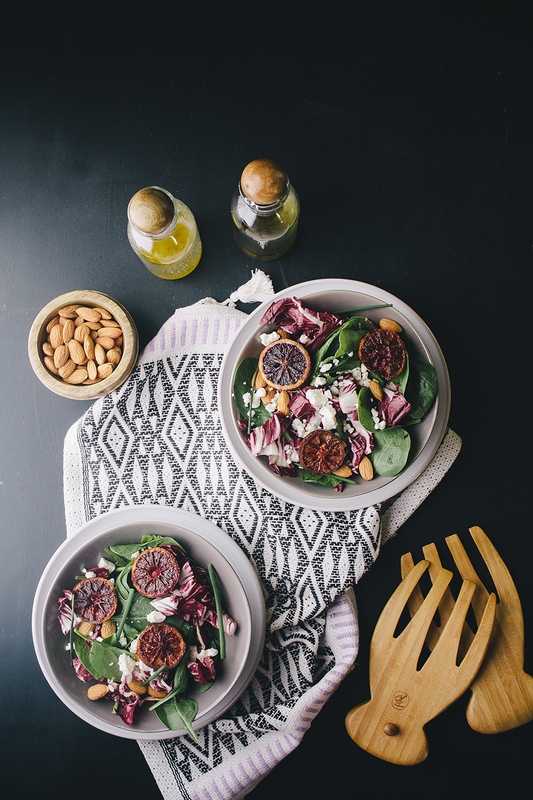 Broiled blood oranges! You beautiful little genius! 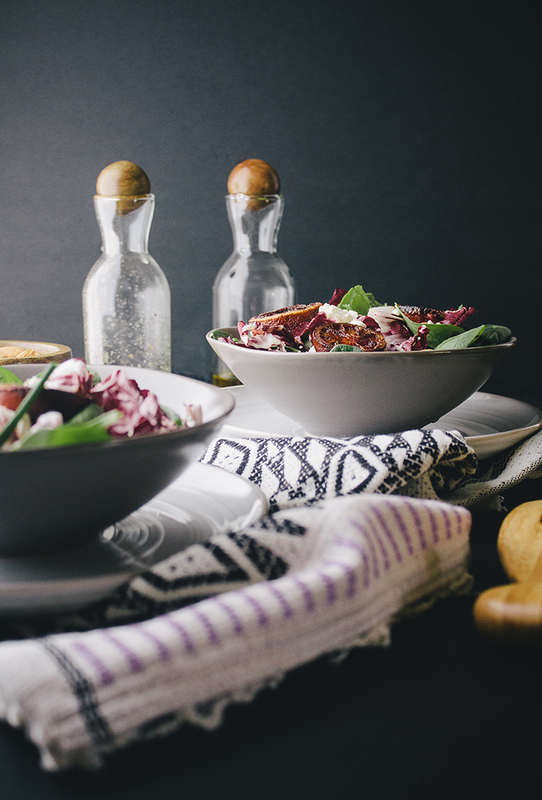 This salad is so gorgeous – can’t wait to see what other salads you ‘cook’ up this summer! Oh and please tell me where you got those cool dressing bottles… I want! This salad looks like a work of art! 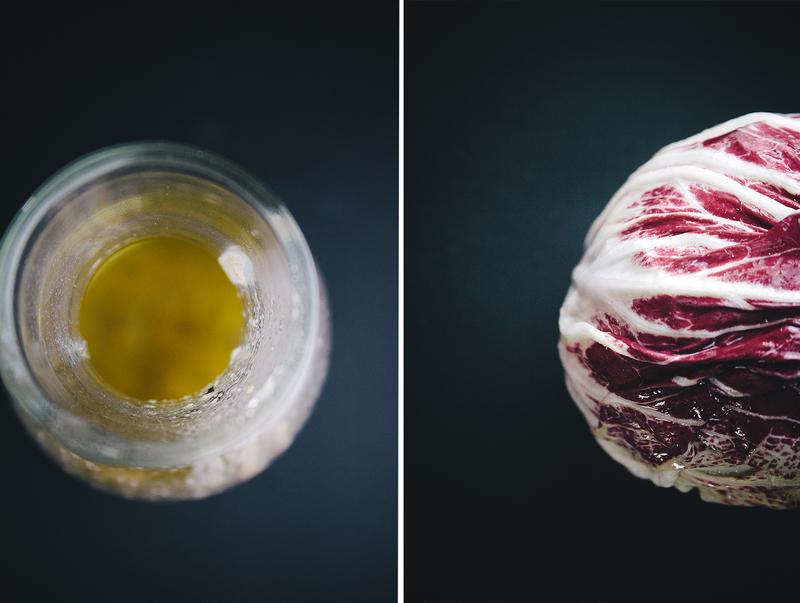 I’m crazy for blood oranges and radicchio. And it’s just turning to winter here in Australia, so sign me up. 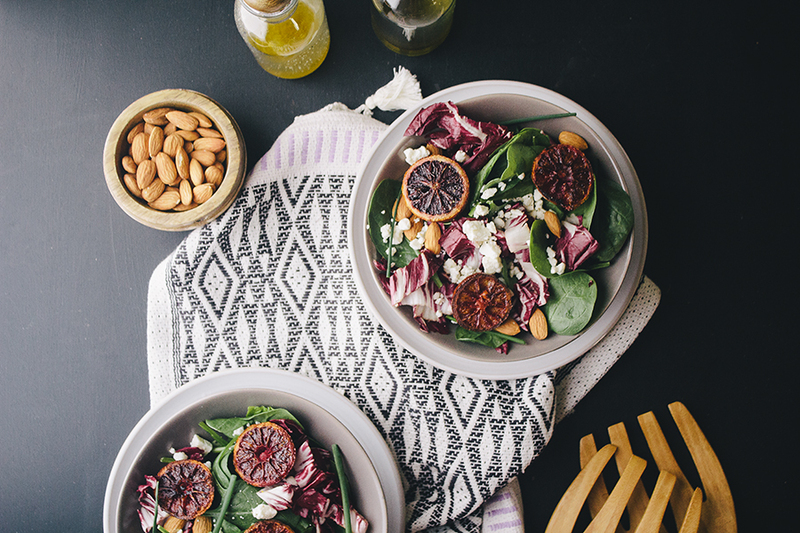 I’ve never thought to use broiled citrus in a salad, and look forward to giving it a go. 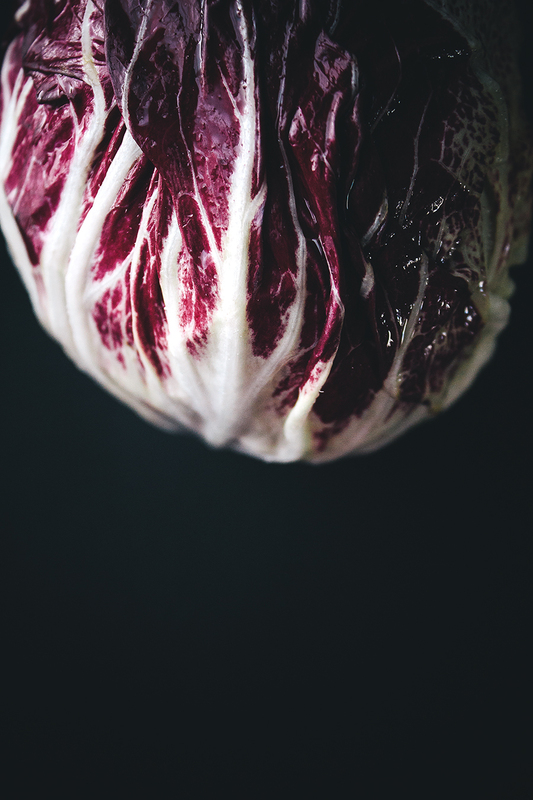 I bet it’s delicious with the beautifully bitter radicchio. salad alert! this is awesome, shelly – broiled citrus just sounds so good, i’ve got an old orange laying around, perhaps the perfect time to throw him in the oven. and totally loving your dish towel/placemat big time! this is curious! I have 3 dying oranges but i think i can still fetch a handsome load of blood oranges for this experiment. thanks for the beautiful idea! Your pictures are so beautiful ! You have a lot of talent! I just don´t undestand how to do the vinegret? whats a broiler?